I wrote this guide thinking in the user's who want's develope dynamic application's with the GWT (Google Web Toolkit) in an AMP(Apache,MySQL,PHP) environment's. The basic idea is write a small and very simple application using MySQL and PHP at the server side, and GWT for the client interfaze, using JSON for the communication between the client and the server. 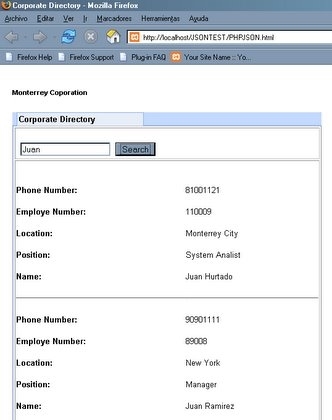 We going to develop a small application to search employees data in a MySQL DB, using the employee name as parameter. 1. Working at the server side. // We fill the $value array with the data. Let's go and work now in the client interfaze with GWT. 3. Working at the client side. 3.1 The JSON RPC example. Google offer some samples applications with GWT. One of this show us how to use GWT with JSON to request a Yahoo service. We take this example as base to write our interfaze, the original google JSON RPC example can be downloaded from here. 3.2 Making a new application. We need replace the original package line in all this files for the package line of our project. Also we will need check the file JSONParser.java and replace the path's (ILcom/juan/client/JSONValue). Then we import the project to Eclipse as the GWT documentation show us. 3.3 Working in the application. * When the user click the button we fetch the URL. * Here we clear the grid and fill it with the new values. * Here we fill the grid. You will find all this methods in the file JSON.java in the JSON RPC google example. As you can see in the requestChildrenGrid(JSONValue jsonValue) method the JSON Document is divided in key's and value's, then format the key's with bold font and attach it to a grid, and then to the panel. 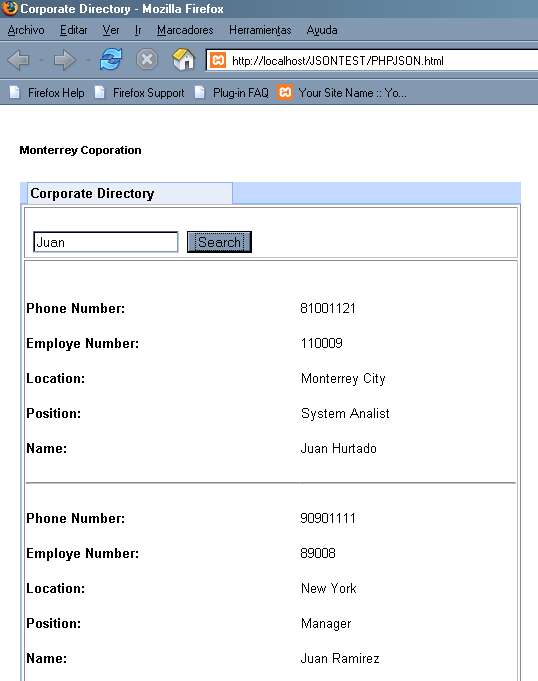 Finally we edit the PHPJSON.java file and call to the JSONRequester to attach the result to the root panel. You can download the server and client code from here. Hope this little example be useful to you.